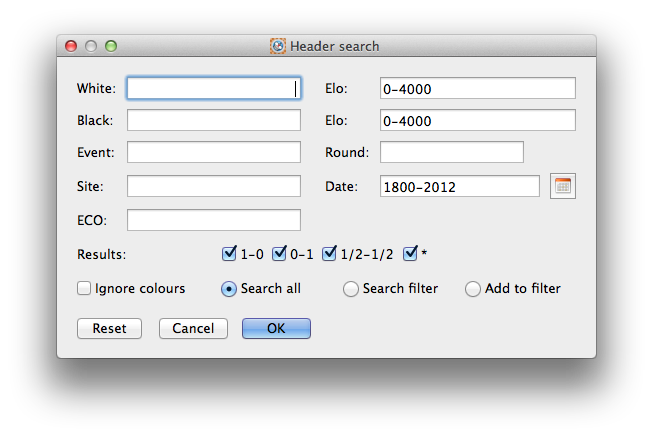 Accessed by clicking the Header search shortcut icon.The dialog is also accessed from the Search->Header menu item. This dialog allows you to search the current database for games matching the search criteria, the search results are known as the as the search filter. 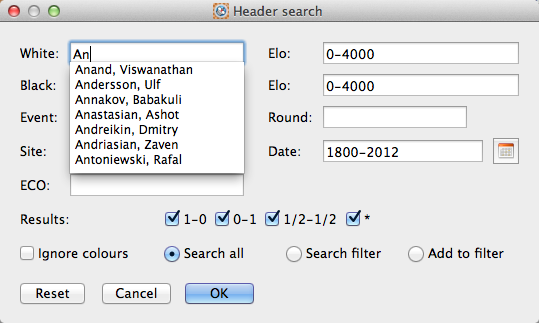 You can specify any of the fields in the dialog to search for, or leave them blank to indicate match all for that field. You can use the Ignore colours checkbox to indicate that the White and Black fields can also apply to Black and White thereby matching both colours. As you type a name in the White, Black, Event or Site field HIARCS Chess Explorer will aid your selection by giving you possible values based on what you type, this is a great help in remembering difficult names or events etc. You can specify an elo range for each player. You can even specify the date range for the search down to an exact date range including days. The integrated calendar selector is accessible from the calendar icon which allows you to easily do this. The default is to Search all games in the database and create a new search result filter of the the games found. The search result will be listed in the game list of the Game Explorer pane. This enables you to search the games in the current filter only. It will create a new search result filter out of the the games found. The search result will be listed in the game list of the Game Explorer pane. This enables you to search all games in the database and add the search results to the current filter of games. The combined results will be listed in the game list of the Game Explorer pane.